A new Weekly Quest Contest has just started. This week's quest game is Kamilah Traveller. The challenge is to complete as many of these Quests this week. The top 3 players at the end of the challenge will receive a Nefarious Costume, 200,000MP and a Gold Trophy, the next 6 players will receive 150,000MP and a Silver Trophy and the next 9 players will receive 100,000MP and a Bronze Trophy. 67 of the Default Avatars have been updated with new artwork. There have been many, many changes to do with Caring for Pets. 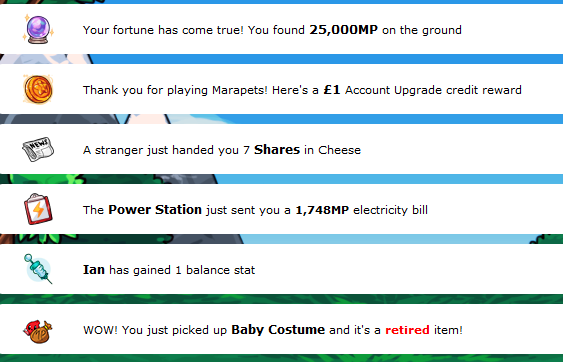 Although we have grown over the years in content, Marapets is and will always be a Virtual Pet Site. The name Marapets was chosen because 'mara' was a reference to death and Marapets would die if not looked after. Over the years this was disabled simply because it was never done properly. We have made a lot of changes now and brought back a lot of the original features of Marapets. Like it or not, many features of the site have no purpose on here if the Caring for Pets is not required. The following update relates to Pet diseases, health and prison. Whenever we say a 'pet is not healthy' this is referring to happiness, hunger and tiredness being neglected and has NO reference to health points used in battling. · Your pet will need to be cared for and healthy. Happiness, tiredness and hunger changes by 5% approx once every 15 hours. This only happens when you are online - if your pets are at 100% happiness and you do not login for 3 months, they will be at 100% when you come back. Each pet's happiness, tiredness and hunger will show as green when it is healthy, orange when it is unhealthy, red when it is being neglected. · When you use items, such as food for hunger, toys for happiness, etc a pet's status will now change by 25% instead of 10%. · If a pet is in the Hotel they will remain healthy without the need to use items. The hotel does not protect from diseases/illness. Queen Bee no longer stings pets that are staying at the hotel. · All Account Upgrades purchased from now on will receive 25,000MP hotel credit. This has replaced extra blog entries or marasite pages. Every player now has a very high amount of these for FREE. · Gym, Elite Gym, School and University can not be used by sick or unhealthy pets or pets that are in prison in the same way that job wages cannot be collected. · If you fail a mission of The Fates only one of your pets will be chosen at random to become sick instead of all of them. · If you are caught at the Grave Robbing only one of your pets will go to prison instead of all of them. · The Puchalla Inn quest now allows you to select which pet may earn a charisma stat. · If you do not pay your Electricity Bill random event, you will be reminded several times to do so. If you still fail to pay the bill after the reminders, one of your pets will be sent to prison. · Finally, pets can once again die if they are not looked after. There has been a lot of panic and confusion over this but its really quite simple. Undying Woods is named undying because pets do not actually die, they just go to the graveyard here and become zombie costumed that other players can rescue. And it takes quite a lot for it to even get that far! If your pet has any kind of sickness or disease, or it has been neglected health wise (starving, thirsty, tired) and is still not looked after, you will have several warnings that show up similar to random events to warn you of the pet that is suffering. If nothing is done about it, you will be reminded several times more. If you still do not do anything about it, your pet will die and move to the Gate of the Graveyard in Undying Woods. You then have 14 days to visit this place and either pay 50,000MP to save your pet and it will be costumed Zombie. If you do not want it be zombie coloured, you can pay 75,000MP. If you do not do this, after 14 days the pet will move to the Graveyard as a zombie where any player can take ownership of the pet and it is no longer yours. A new Weekly Item Contest has just started. This week's item is Jessup Staff, you will need to send this item to the 'Challenge' account. The challenge is to send as many of this item to 'Challenge' this week. The top 3 players at the end of the challenge will receive a Arcade Potato, 200,000MP and a Gold Trophy, the next 6 players will receive 150,000MP and a Silver Trophy and the next 9 players will receive 100,000MP and a Bronze Trophy. A new Weekly Battle Contest has just started. This week's opponent is Mrog, you will need to have a Mrog Trading Card in your Battle Deck. The challenge is to win as many battles against this opponent this week. The top 3 players at the end of the challenge will receive a Operative Trading Card, 200,000MP and a Gold Trophy, the next 6 players will receive 150,000MP and a Silver Trophy and the next 9 players will receive 100,000MP and a Bronze Trophy. Introducing the new and improved... JOB CENTRE!!!! After many months of improvements the Job Centre is now back! The Job Centre in the City of Marada is where your pets can start a career and earn MP each day. There are 24 different careers to start with, each with their own requirements for your pet to meet before being employed. · You can now collect all of your pet's Wages at once at the click of a button. · At the Job Centre you can see all of your pets that are working, their job, level and wages, and any pending promotions. · Looking for a Job? You can now click any Job to see if you have unemployed pets who qualify for these jobs. · All 24 Jobs can now be promoted up to Level 20 - earning more MP the higher you go! · When you reach Level 15 of any job you will still earn a trophy for your pet's profile. · Now when you reach Level 20 of any job your account will unlock a new Job Perk. Different jobs have a different perk to be earned. More information about these is explained below. · If your pet is not cared for properly, is sick or in prison you will not be able to collect wages. · With the new and improved Random Events, Job Promotions are much more frequent. · A new Career History feature has been added for future use. All jobs your pet has from now on will be logged in this history, showing the maximum level of promotion for each job. In the future, the higher this counter is, the more prizes you will be rewarded. · Veterinarian and Doctor jobs will earn Free Hospital treatments permanently. · Architect, Teacher and Scientist jobs will earn Free School MP Tuition Fees for all pets permanently. · Politician and Businessman jobs will earn Free Hotel stays for all pets permanently. · Pop Star and Actress jobs will earn Double Magazines at the Magazine Stand permanently. · Journalist and Astronaut jobs will earn Double Newspapers at the News Stand permanently. · Model and Policeman jobs will earn Double Photos at the Photo Parlour permanently. · Athlete and Chef jobs will earn Double Plates at the Ferris Wheel permanently. · Clown and Fireman jobs will no longer need any Circus Tickets for the Circus mission permanently. · Spy and Thief jobs will receive Half Price Prison fees permanently. · Programmer, Banker and Hacker jobs earn 2 for 1 Raffle Tickets at the Raffle permanently. · Soldier and Mechanic jobs will no longer need any Dentist Tickets at the Dentist permanently. A new Monthly Mission Contest has just started. This month's mission is Penitentiary. The challenge is to complete as many levels of this Mission in a month. You will earn an extra point for each level you complete. Complete level 1 and receive 1 point, complete level 2 and receive 2 points and so on. The April 2017 Monthly Checklist winners have been announced and the prizes have been rewarded. Congratulations to all of those who have won. Don't forget, this is a monthly permanent feature that you can enter for FREE. If you haven't already, you should start entering the May event! We would like to apologise for the unscheduled Site Maintenance since Wednesday. So much had changed with the servers since the February crash - new hard disks, new software, etc and we were still having random, unexplained crashes. We had 3 server kernel panics this month alone! The issue was that many of our servers in the cluster were running different versions or had other slightly different configuration. They were being fixed one by one but it was taking far too long. We took the decision after the Wednesday crash to keep the site down and just do a fresh install of all servers at once. We thought we could bring 50% up within 12-24 hours and therefore downtime was limited. This wasn't the case and with the many issues we ran into along the way, it took 4 days altogether! The good news is that it was a complete success. Everything is now consistent, stable and should run without any issue or lag. Thank you for your patience and understanding. The Invisible Account Upgrade package has been put back on sale for 3 days. The Astro, Ideus, Ike, Kidlet, Knutt, Poera, Vlad, Walee, Yakubi and Zola can now wear American Costume. The Lottery has been drawn for this week. TheIrishPirate is the winner of the 582,200MP Jackpot with the winning numbers of 5, 11, 17, 26, 28 and 49. Congratulations! Last Week's Raffle has now ended. gennie is the winner of the Red DNA and 100,000MP prize with the winning raffle ticket number 559! Congratulations! Make sure you buy your tickets for today's raffle - only 10MP per ticket! The Game of the Week has changed to Newth Snowboarding. Voting has closed and a new Shop of the Week has been decided. For the next 7 days, the Costumes shop has a 2 for 1 sale. Every time you buy an item from this shop you will pay for one and receive two. Vote Now for next week. All pets wearing a Glass Costume will receive Double Training stats this week at the Gym and Elite Gym. Vote Now for next week. All pets wearing a Ice Cream Costume will receive Double Education stats this week at the School and University. Vote Now for next week. A new Weekly Item Contest has just started. This week's item is Pumpkin Eye Makeup Powder, you will need to send this item to the 'Challenge' account. The challenge is to send as many of this item to 'Challenge' this week. The top 3 players at the end of the challenge will receive a Festive Bread, 200,000MP and a Gold Trophy, the next 6 players will receive 150,000MP and a Silver Trophy and the next 9 players will receive 100,000MP and a Bronze Trophy. The Astro, Crikey, Kidlet, Knutt, Kujo, Snookle, Speiro and Zoosh can now wear Tiger Costume. A new Weekly Battle Contest has just started. This week's opponent is Frankie, you will need to have a Frankie Trading Card in your Battle Deck. The challenge is to win as many battles against this opponent this week. The top 3 players at the end of the challenge will receive a Party Popper Trading Card, 200,000MP and a Gold Trophy, the next 6 players will receive 150,000MP and a Silver Trophy and the next 9 players will receive 100,000MP and a Bronze Trophy. And they're gone! Marahomes and their Gardens have been removed. All MP you spent building your home has been refunded. Recently planted (not dead) seeds have been returned to your Inventory. Seeds have also been turned into toys - just like Furniture and Appliances! Minipets no longer have a pointless status (happiness, bladder, etc) and therefore the Resort in Minipet Island has been discontinued too. A new Gardening and resort feature will be released soon. All Avatars or Goals related to homes have been changed. Anything related to Gardens will move to the new feature as soon as this is released. A new Cheese Shop has opened in Gigantic Paradise. There are 30 new gourmet Cheese items. This has replaced the 'Flooring' shop in this world and all carpet items have turned into gourmet cheese items. The Wallpaper shop in Baspinar's Castle has been removed and the items were turned into gourmet cheese items too. 20 of these cheese items replaced Carpet & Wallpaper items and 12 are newly restocking. The Cheese shop has also started trading on the Stock Market. The Ice Cream Shop has 33 new items restocking. Some of the oldest Ice Cream items (artwork from the day Marapets first opened) have been revamped. The Ice Cream shop has also started trading on the Stock Market. Can you find the 'Brain Freeze' Hidden Avatar? The Lottery has been drawn for this week. Dare is the winner of the 2,146,900MP Jackpot with the winning numbers of 1, 5, 27, 32, 40 and 42. Congratulations! Last Week's Raffle has now ended. SleepyZombie is the winner of the Red DNA and 100,000MP prize with the winning raffle ticket number 1287! Congratulations! Make sure you buy your tickets for today's raffle - only 10MP per ticket! The Game of the Week has changed to For Sale. This week's Olympics Event is Running. Voting has closed and a new Shop of the Week has been decided. For the next 7 days, the Minipets shop has a 2 for 1 sale. Every time you buy an item from this shop you will pay for one and receive two. Vote Now for next week. All pets wearing a Halloween Costume will receive Double Training stats this week at the Gym and Elite Gym. Vote Now for next week. All pets wearing a Grey Costume will receive Double Education stats this week at the School and University. Vote Now for next week. The latest pet to be improved is the Phanty. We hope you like the changes! The Cheese Costume was first released in February 2006 (over 11 years ago!!) in Account Upgrades and the costume has been retired and neglected ever since. We have released a new version of the Cheese Account Upgrade with 8 new Cheese themed items and either a Cheese coloured Limax or Murfin Enchanted Plushie. This AU will retire May 10th. There are 56 new pets that can wear the Cheese Costume. We have also updated 8 Cheese pets to their newer version. In total 68 out of 76 pets can now wear the Cheese Costume - this costume will soon be wearable by ALL pets! All Cheese Photos have now been released. Introducing the new and improved... STOCK MARKET!! After many months of improvements the Stock Market is now back! The Stock Market in Puchalla Village is where you can invest your own MP in many of the Shops through out Marada. The share price of each shop changes throughout the day, depending on the level of stock, number of customers, profit and other various factors. ⋅ You can only buy shares in a company with a share price of 100MP or above and below 1,000MP. ⋅ You can only make one purchase of shares every 3 hours. A purchase can be between 1 and 100 shares in one company. ⋅ Shares in a company cannot be sold within 2 hours of purchasing new or additional shares in this company. ⋅ There is a new 'Stock Market News' letting you know of all the changes in share prices throughout the day. These are effected by hundreds of different factors happening around Marada including shop sales, shop profit, shares given out for free, shares sold recently and other mission, quest and general game play factors. ⋅ There are also new random and environmental events that can happen to each company that may push its share price up and down more than expected - such as bad weather, new trends, etc. ⋅ In extreme cases, a company can now go bankrupt. If a company goes bankrupt you will lose any MP invested in this company and shares can no longer be bought in this company while it is in administration. You will be notified in the news when the company has recovered and has shares back on sale. ⋅ You may be lucky and win Free Shares randomly when you restock any item from a company's shop. ⋅ Any shares you held in the old version of the Stock Market were automatically refunded at the value you originally paid for them. A new Weekly Quest Contest has just started. This week's quest game is Robot Repair. The challenge is to complete as many of these Quests this week. The top 3 players at the end of the challenge will receive a American Costume, 200,000MP and a Gold Trophy, the next 6 players will receive 150,000MP and a Silver Trophy and the next 9 players will receive 100,000MP and a Bronze Trophy. Today's random theme is... MAGENTA! Eleven new Magenta items have been added as prizes around the site. Win Magenta Pancake from the Pancake Pile, Magenta Feather and Magenta Feather Plushie from Talon, Magenta Jelly from the Jelly Castle, Magenta Potato from Guess the Weight, Magenta Gumball from the Gumball Machine, Magenta Sugar Cube from the Sugar Stack game, Magenta Worms from Worm Digging and finally, the Ball of Magenta Yarn from Farming quests. All missing Photos have been released - including 73 Magenta Photos! The Belle, Flurso, Gruff, Bottled, Noot and Terra minipets can now wear the new Ball of Magenta Yarn. Can you find the 'Magenta' Hidden Avatar? These 11 new Magenta items are on sale at various shops around Marada. A brand new Magenta Costume is now restocking in the Costume shop. 73 out of 76 pets can now wear this new costume. A new Weekly Item Contest has just started. This week's item is Gym Stamp, you will need to send this item to the 'Challenge' account. The challenge is to send as many of this item to 'Challenge' this week. The top 3 players at the end of the challenge will receive a Anubis Easter Egg, 200,000MP and a Gold Trophy, the next 6 players will receive 150,000MP and a Silver Trophy and the next 9 players will receive 100,000MP and a Bronze Trophy. There are 12 new pets that can now wear the American Costume. A new Weekly Battle Contest has just started. This week's opponent is Easter Bunny, you will need to have a Easter Bunny Trading Card in your Battle Deck. The challenge is to win as many battles against this opponent this week. The top 3 players at the end of the challenge will receive a Cupty Trading Card, 200,000MP and a Gold Trophy, the next 6 players will receive 150,000MP and a Silver Trophy and the next 9 players will receive 100,000MP and a Bronze Trophy. The Forums have had a huge update. When you post a message on a topic or start a new topic, it no longer has an outdated redirect. When you create a topic and select the option to receive alerts, these are now smaller and stacked with the MaraTalk alerts at the top of each page. The alerts will remove automatically when you view the topic. We have also fixed it so that if you refresh you will no longer double post on a topic. Forums have a new Mention feature where you can tag any player by their many usernames on the forums. You can mention upto 10 players per post. Simply enter @user with user being their username. It will automatically add their username and a link to their profile on your post and send them an alert, linking them to the forum where you mentioned them! To make it even easier, there is a clickable @tag of all players who have posted a reply on the topic before you reply. If you want more control over who can or cannot mention you on the forums, you can edit your setting at your Signature page. Our old emoticons have been updated with these new and improved Maramojis! You can now show an image of your doll on Forums, Blogs, MaraTalk and Club Chat with the tag [DOLL] or [doll]. If you have a Default Pet you can easiy use the new [PET] or [pet] tag to show an image that links to your default pet's profile. Can you find the new 'Maramoji' Hidden Avatar? The Decadal, Echlin, Paffuto, Raulf and Zoosh can now wear the Sketch Costume. A new feature has been added to quickly Use Items. It shows all of the items in your Inventory and gives you the option to use upto 20 items at once. Be sure to select the correct pet at the top of the page when using items on a pet! You can now browse all items in your Attic by rarity. For all players that celebrate, we would like to wish you all a Hoppy Easter. The Easter Bunny will hop in and out of Marada today and tomorrow only - but you have until May 31st to enter and complete the Easter Egg Hunt! We hope you all enjoyed the 2017 Easter events! The Account Upgrades Shop has these special new limited edition items on sale. They will automatically retire May 14th. Can you find the 'Easter Egg Hunt 2017' Hidden Avatar? The Lottery has been drawn for this week. Kristalia is the winner of the 2,628,400MP Jackpot with the winning numbers of 6, 20, 29, 34, 42 and 44. Congratulations! Last Week's Raffle has now ended. checkers518 is the winner of the Red DNA and 100,000MP prize with the winning raffle ticket number 2207! Congratulations! Make sure you buy your tickets for today's raffle - only 10MP per ticket! The Game of the Week has changed to Klondike Solitaire. All pets wearing a Floral Costume will receive Double Training stats this week at the Gym and Elite Gym. Vote Now for next week. All pets wearing a Invisible Costume will receive Double Education stats this week at the School and University. Vote Now for next week.